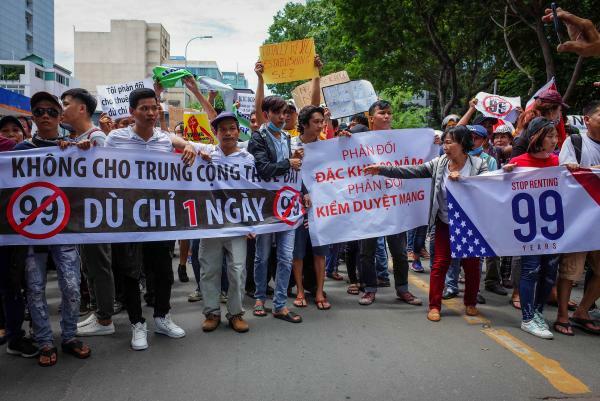 June 11 (UPI) — Vietnamese police arrested more than 100 people in demonstrations against proposed laws protesters say limit Internet freedom and favor Chinese investors. Police said 102 people were detained over the weekend after the protests turned violent. Authorities accused the protesters of throwing Molotov cocktails and rocks at the People’s Committee Headquarters in southeastern Binh Thuan province. Thousands of people demonstrated Sunday against the cyber and economic-zone bills the National Assembly is considering passing into law. One of the bills would allow foreign investors 99-year leases in special economic zones. Protesters said they feared this would give Chinese investors too much control. China’s Embassy in Hanoi warned its citizens to be careful, referring to the protests as “illegal gatherings” which include some “anti-China content,” the BBC reported. Vietnam has a tense relationship with China. China once colonized Vietnam and a border war between the two countries occurred less than 40 years ago. There also are ongoing rival claims between China and Vietnam over territory across the South China Sea. Protesters also opposed a bill requiring Internet companies based in the United States such as Facebook and Alphabet, the parent company of Google, to store Vietnamese users’ data and open offices there.